Things are getting saucy! That’s the best description for the last couple classes. We’re learning how to make the mother sauces, which are the backbone of many traditional and contemporary dishes. The mother sauces were defined by Auguste Escoffier in the early 20th century and remain staples of every kitchen (and culinary education) today. In order to get to the sauce, you have to start with the roux. Roux is a combination that’s equal parts butter and flour, whisked together in a saucepan over mild heat to one of three consistencies and then added to the base of your sauce as a thickener. There’s white roux, which is the thickest, blonde roux that’s slightly thinner and brown roux, the thinnest of the three. Depending on the type of sauce you’re making, you will use a different roux. 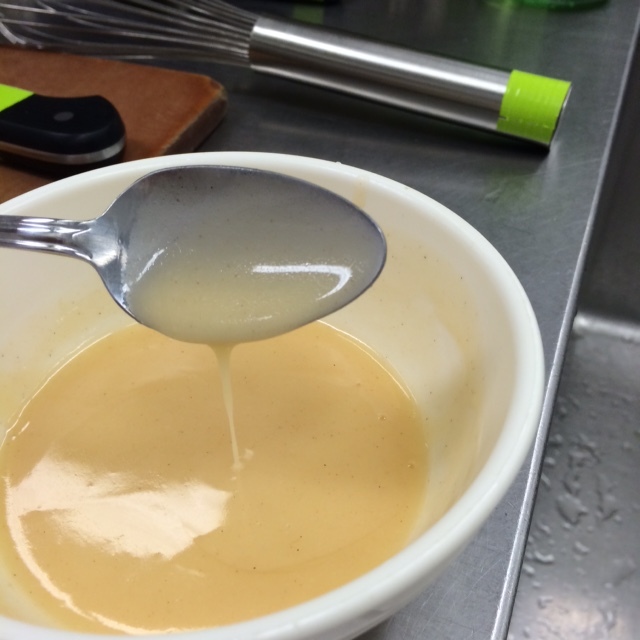 White or blond roux would be used for lighter sauces and brown roux would be used for the darker or brown sauces. We first played with roux on the night we made a béchamel sauce. The dish we’d make for this wonderful little sauce was a very basic macaroni and cheese. Technically, we made a mornay sauce because we added cheese to the béchamel, thus making it a daughter, or small sauce. There are infinite combinations one can make when starting with any of the mother sauces. Extra credit to those that know what they are before reading the next sentence! The 5 mother sauces are velouté, béchamel, hollandaise, espagnole, and tomato. Buerre blanc sauce – look at that perfect nappe consistency! We took a break from the mother sauces and made a buerre blanc, which was to DIE for. This is one of the simplest, yummiest sauces to make. 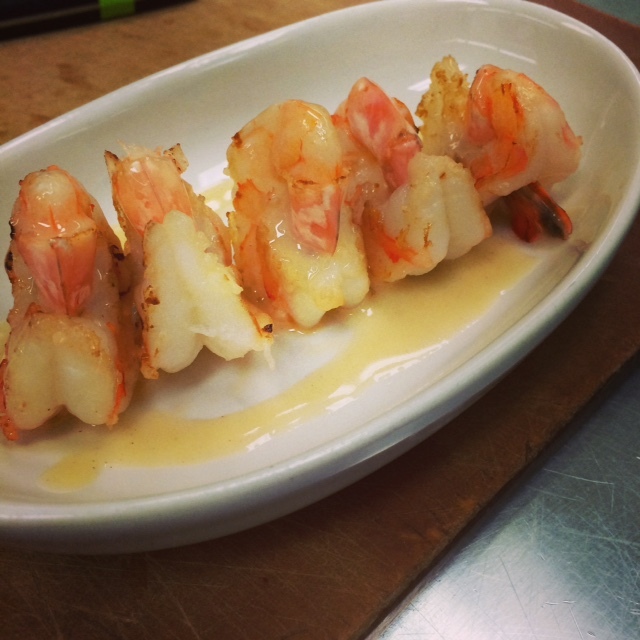 I drizzled mine over some sautéed shrimp and holy cow, was this so good. It’s a simple combination of butter, shallot and white wine but it’s so luxurious that it would make any dish feel upscale. On velouté night, we made an allemande sauce for chicken a la king. A dish that I haven’t had in probably 20 years, it tasted exactly as good as I remembered it, if not better. This particular class couldn’t have come at a better time of year. The temps are dropping, the layers of clothes are increasing and cravings for comfort food are a regular occurrence. I’m definitely going to put on a few pounds if we keep cooking like this. Of course, it probably doesn’t help that I’m basically eating two dinners twice a week – the first from the cafeteria before class, and then whatever scrumptious thing we make in class. Sometimes it’s hard to resist what’s in the cafeteria and then when I taste what we make, one bite is never enough! Three more weeks of this quarter left to go – and I have some of the most exciting recipes to look forward to! Check back in later to find out what they are!